I am in the fortunate position, many times, to get asked to read and review a book by another author. While the manuscript I review is free to me, I try to be honest in the review. 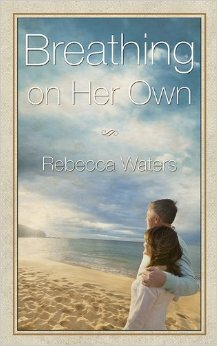 Breathing on Her Own by Rebecca Waters is one such book. It is not a romance but a contemporary women’s fiction. As well as a complex journey that a family takes on in healing and faith. What if, after your adult daughter’s accident, the most hopeful words someone could say to you was “At least she is breathing on her own?” This is the reality that Molly Tipton and her husband are faced with after they learn their oldest (married) daughter was involved in a car accident and barely alive. The other occupant of the car as dead. A sharp curve, dark night and alcohol were involved. Throw in a difficult recovery and other losses as well as the possibility of a lawsuit for vehicular homoside and Molly soon realizes that her daughter is not the only one who is injured. Molly’s faith, or lack of it, is scraped raw by the events surrounding her daughter and she comes to realize how much she has to grow and learn and recover herself from a paralytic faithlessness. As they struggle with the physical aspects of healing the family, and especially Molly, are challenged with their spiritual healing as well. Can God provide and make good the mistakes of the past? This is a well written story that takes you into the pain of a family struggling through a crisis not only of physical pain, but financial and spiritual as well and discovering God’s restorative hand doesn’t always give us what we want, but exactly what we need. The book is available on preorder and is due out on the 25th of March.